After watching Friday night’s debate and assimilating the verdicts of various analysts and pundits, I think it’s fair to say the debate was a draw, or a very slight Obama win. John McCain performed better than expected, and Obama proved, once again, that he is a very capable and knowledgeable person who can be trusted as President. McCain also scored some by trying to paint Obama as inexperienced, saying several times throughout the debate, that Obama “just does not understand.” However, he appeared dismissive and condescending toward Obama. Next stop is the Vice-Presidential debate between Joe Biden and Sarah Palin. We will be there! Okay, this is too funny!!! Obama sings to Kanye West, featuring John McCain, Sarah Palin, and George Bush. Wall Street is crumbling, but let’s joke about it instead. I made up this one. Treasury Secretary: Mr. President, Wall Street is on the verge of crumbling. 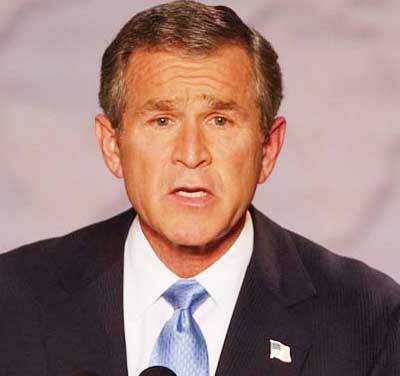 George W. Bush: Why don’t we just take another street? And why is it crumbling? Get some engineers in there. You are currently browsing the My Blog blog archives for September, 2008.